The reviews are in. 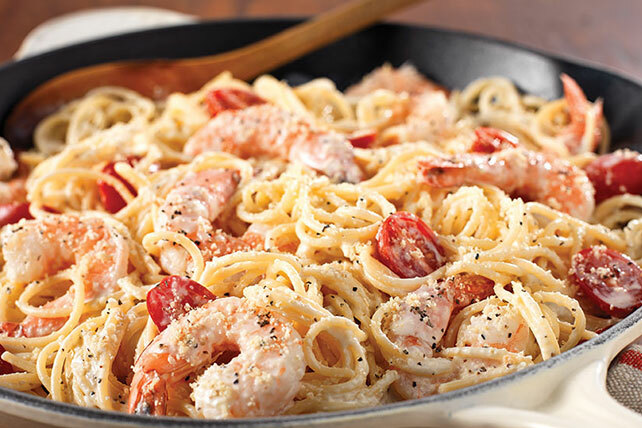 Families love this Cracked Black Pepper-Shrimp Alfredo. Best of all: This pasta dish is ready in just 20 minutes. Meanwhile, bring milk just to simmer in large nonstick skillet, stirring constantly. Add cream cheese, Parmesan and pepper; cook and stir 3 to 5 min. or until cream cheese is completely melted and sauce is well blended. Add shrimp and tomatoes; cook and stir 2 min. or until heated through.